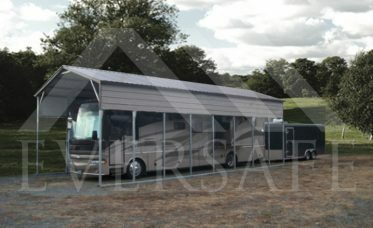 Putting up an RV Shelter to protect your investment has never been easier or cheaper. If you’re looking to protect your expensive motor home then you’ve come to the right place. 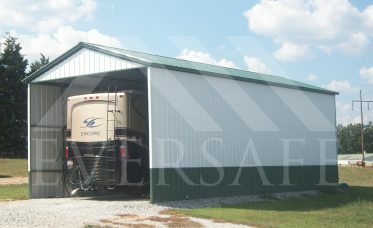 Eversafe Buildings offers high quality Metal RV Storage Buildings and RV Carports at the best prices. 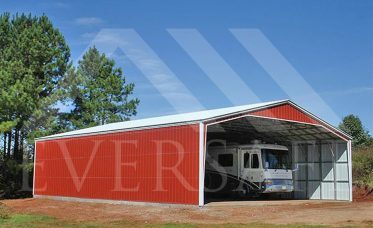 Unlike RV Covers that are covered in cheap vinyl tarps and are just pinned together, Eversafe Buildings delivers and installs high quality steel RV Storage Buildings that are built to last and can be built directly on the ground, on concrete or even on pavement. Our RV Shelters will protect your RV, motor home or camper for years to come, saving it from the harsh elements Mother Nature has to offer. High winds, rain, snow, hail, ice and even extreme heat are no match for our buildings. 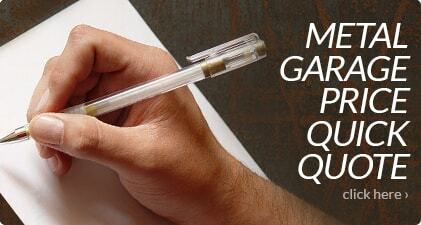 Are you looking for an RV Cover that will save you money? 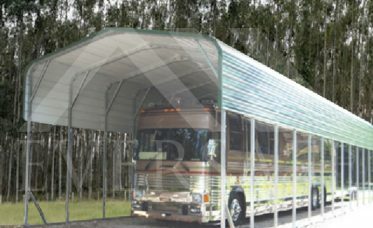 We offer the best quality RV Carports in the industry that can be fully customized to your specifications and can be designed and are guaranteed to meet your state and county building codes. Our steel RV Covers are available as standard in 14 Gauge 12 Gauge Steel frames depending on where you’re building and are available with a 20 year rust through warranty. 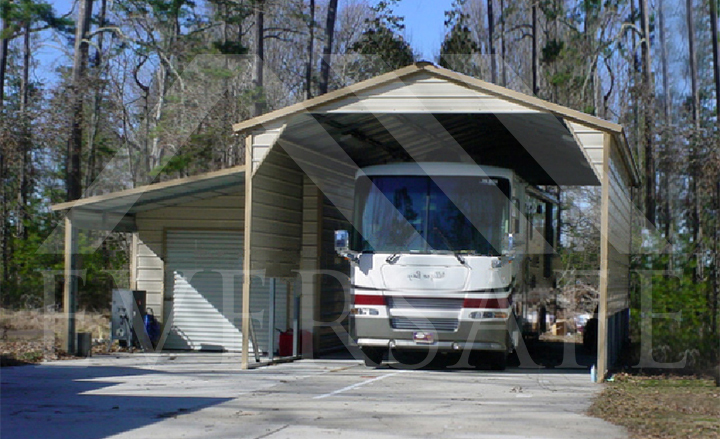 RV storage buildings are a necessity for anyone who owns a recreational vehicle. Proper storage of these vehicles in an Eversafe storage building will help reduce wear and tear, protect it from the elements, and guard against theft. Many insurance companies will offer lower rates for storing the vehicle in these structures because of the protection they provide. In addition to the vehicle, it’s a bonus to be able to store anything that goes with the vehicle including tools, features, furniture and other items. RV owners also use the storage shelter as a workshop for routine maintenance and repairs before their next trip. These buildings can be custom designed to not just store the RV but other recreational vehicles like boats, classic cars and ATV’s either by selecting a bigger model or by adding a low cost lean-to. 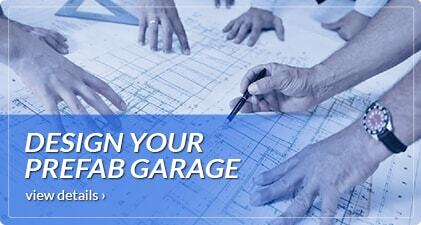 The lean-to is a popular feature because it’s very affordable and offers several uses. Height is not a problem as you can design the structure to be high enough to store the vehicle with plenty of clearance and enough space to put shelving adjacent to the side walls or even add a loft. The flexibility in design makes it easier optimize the use of the structure and helps you to get more out of your property. Because these units are prefab steel, you can easily extend them later or enclose them. An Eversafe consultant can assist you with drawings for the slab design and permits, selecting which options are best for you and more. 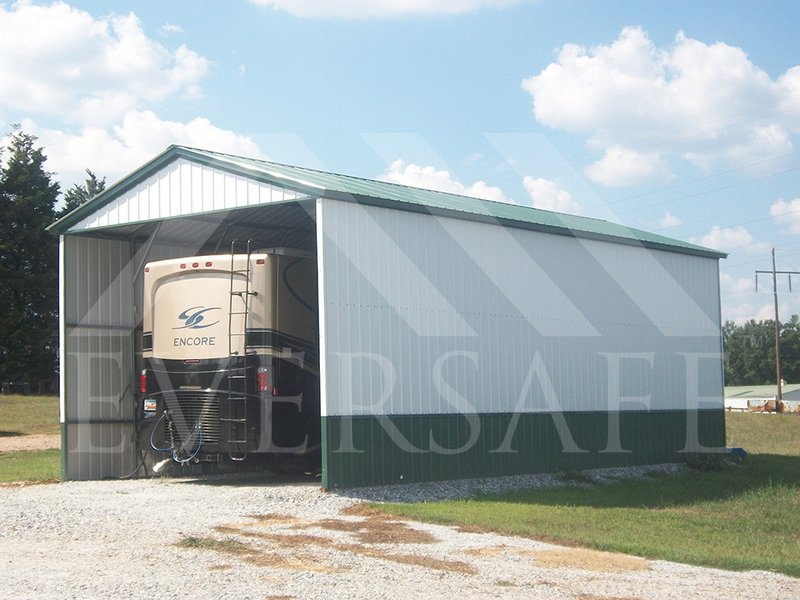 Eversafe prefabricated steel units offer affordable options for RV storage buildings that will protect your vehicle from theft, wind, sun damage and other things RV owners need to be wary of. 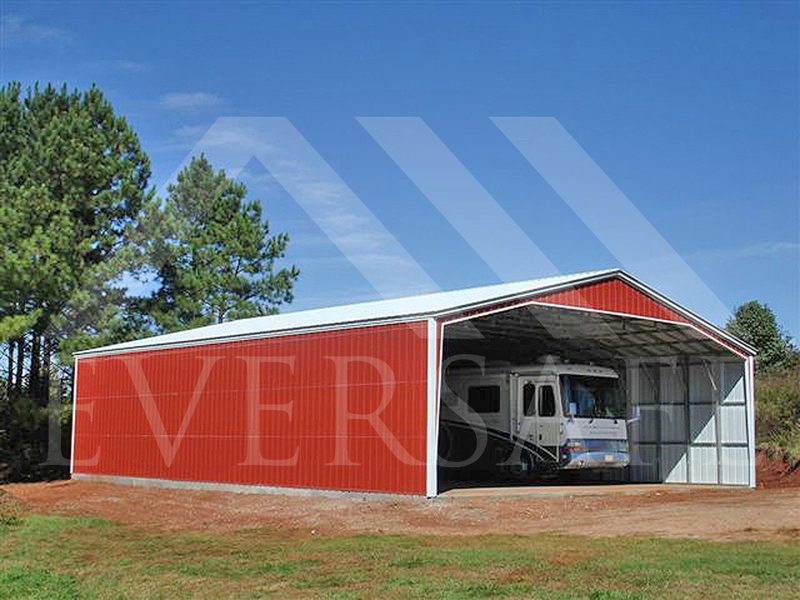 These prefabricated steel buildings are a great addition to any property and can be ordered online and quickly delivered and installed. 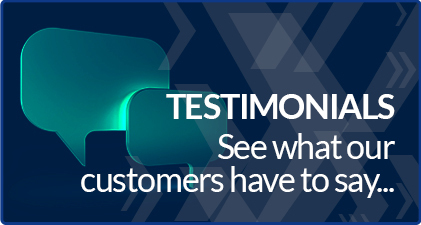 If you have a question regarding design, uses, slab design, installation or anything else, contact us by the chat message window or give us a call for a free quote and consultation. 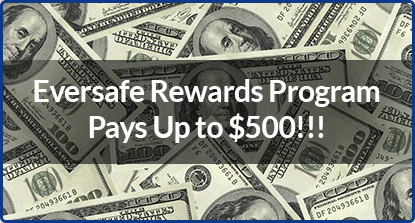 Protect your investment and save with Eversafe Buildings. 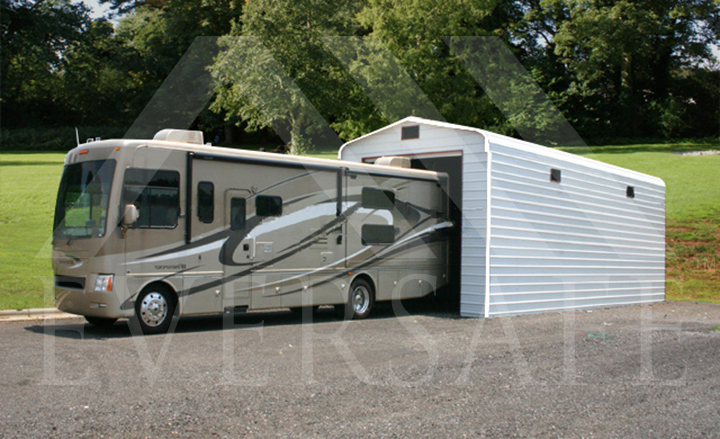 We provide all the materials you need and your RV metal building is delivered quickly and efficiently. We make the process a snap! From ordering your RV cover up until your it’s delivered and erected, we’ll walk you through the entire process to make it as simple and painless as possible. 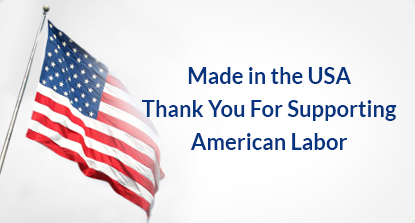 Our years in the steel building industry ensures a smooth and effortless experience as we’ve simplified the process for you. 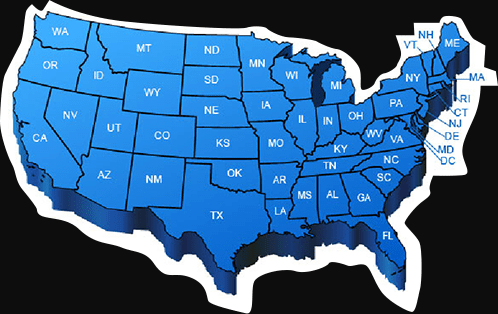 Call our offices today at 1-800-374-7106 and one of our experienced building specialists will answer any questions you have about our RV storage buildings.